Please fill in all required fields and resubmit the form. Rivet Rack Storage Systems consist of sturdy 14 gauge Steel Uprights, 60" wide Rivet Rack Tire Beams and 12" deep Double Rivet MD Beams. Units can be secured to wall with 18" Double Row Tie (rivets on wall side must be trimmed off & holes drilled on site). Add on racks are available as well as double entry/ free standing units. Units are easily assembled on site. Primary framing members lock together for easy assembly without bolts, rivets or other fasteners. Simply measure spacing & connect beams with a rubber mallet. Concrete WALL anchors (fasteners) are not included. SHIPS L.T.L. on a Common Carrier prepaid and added. 5' Width-x 8' High x 12" deep, 3 Tier, Rivet Wedge Lock Rack Unit. Holds approximately 18-22 Tires total. 5’ Width x 10’ Height x 12” Depth 4 Tier, Rivet Wedge Lock Rack Unit. Holds approximately 24-28 tires total. 5’ Width x 12’ Height x 12” Depth 4 Tier, Rivet Wedge Lock Rack Unit. 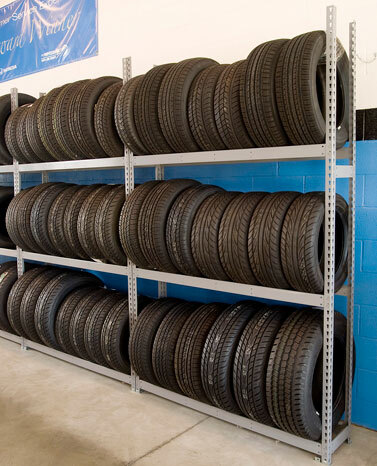 Holds approximately 30-35 tires total. ©Copyright Tire Displays Wheels ® 2019.